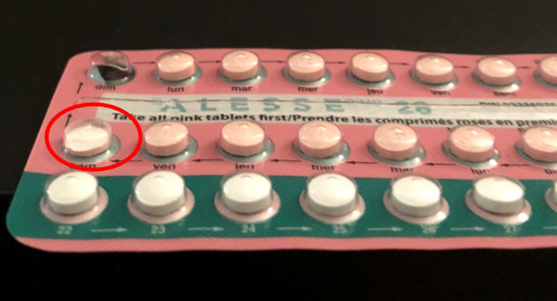 Health Canada is advising consumers and health care professionals that complaints have been received for packages of Alesse 21 (21 active pills) and Alesse 28 (21 active pills, 7 that contain no hormones). The blister packages for both contained an active (pink) pill that was roughly half the proper size. Alesse 21 and Alesse 28 are prescription drugs used to prevent pregnancy. Check your pills before and after taking them out of the blister package. Do not consume a pill if it looks unusual. Examine both sides of each pill thoroughly for anything unusual before taking it (such as, a different (paler) colour, jagged edges, or the pill is broken or smaller than normal). It may not be immediately obvious from looking at the blister package that there is a problem with the pills, as the underside of the pill cannot be seen while in the blister pack. Check each blister pack of Alesse 21 and Alesse 28 before dispensing it to make sure the pills look as they should. Report any unusual packages to the company (Pfizer Canada) and to Health Canada. Broken or smaller-than-normal birth control pills may deliver a smaller dose of the active drug ingredient, which could reduce its effectiveness in preventing pregnancy.